//	Huawei Honor 5X vs. OnePlus X: Which is the Best Phone for Under $250? Huawei Honor 5X vs. OnePlus X: Which is the Best Phone for Under $250? Huawei Honor 5X and OnePlus X were both released last year and there no doubt that these two are worth more than their price tags. Both phones come with premium designs, top of the table features under the hood, a decent camera as well as a hard-to-match price tag, among other decent specs. To help you tell them apart, here is a look at the specs, features as well as pricing of thee Huawei Honor 5X in comparison to the OnePlus X.
OnePlus is a rarely known company that came to the limelight with its stylish phones that were only available via invitation. What this means is that in order to have one of their phones, you had to be invited by another person to the system. However, this is no more as the company probably noticed that the system prevented the spread of the brand’s usage across major markets in the world. With the release of the OnePlus X, things started sailing smooth as far as buying the phone is concerned. For starters, it gets a lot better as one learns that the phone in question here weighs just 138 grams and is 6.9mm thick. The rear is made of zirconia ceramic with the body receiving a metallic frame brushed anodized aluminum where the edges are also chamfered. On the contrary, the Huawei Honor 5X is quite large with its 8.2mm thickness and 158 grams of weight. Unlike the OnePlus X, the entire body of the phone is made of aluminum, with a fingerprint sensor resting just below the camera sensor. As far as the display is concerned, the larger Huawei Honor 5X has a screen size of 5.5-inches. The display is of IPS LCD type with a 1080p resolution that manages a pixel density of 401ppi. On the other hand, the smaller OnePlus X has an AMOLED screen size of 5 inches. The display has the same resolution as the larger 5X, but it gets better in display sharpness thanks to its pixel density of 441ppi. Under the hood, the 2015 OnePlus X comes with a 2014flagship chipset from Qualcomm – the Snapdragon 801 SoC. The quad-core Krait 400 CPU inside the phone clocks a speed of 2.3GHz and is supported by an Adreno 330 GPU and a massive 3GB RAM. On the other hand, the Huawei Honor 5X packs a newer but mid-ranngeocta-core Qualcomm Snapdragon 616 SoC that is supported by an Adreno 405 GPU and RAM of either 2GB or 3GB, depending on the variant. In terms of storage, the two phones have internal memory of 16GB and it can be expanded using a microSD card slot of up to 128GB. The two also share the same size of rear camera – 13MP -however, the front of the Honor 5X has a 5MP snapper while the OnePlus has a decent 8MP sensor. Despite all the goodies that come with the OnePlus X, the phone has a rather disappointing battery unit of 2525mAh as compared to the solid 3000mAh battery capacity installed on the Honor 5X. Still, you will enjoy an even better price for the latter device, which currently sells for just $199.99 as compared to the $250 needed for the OnePlus X. 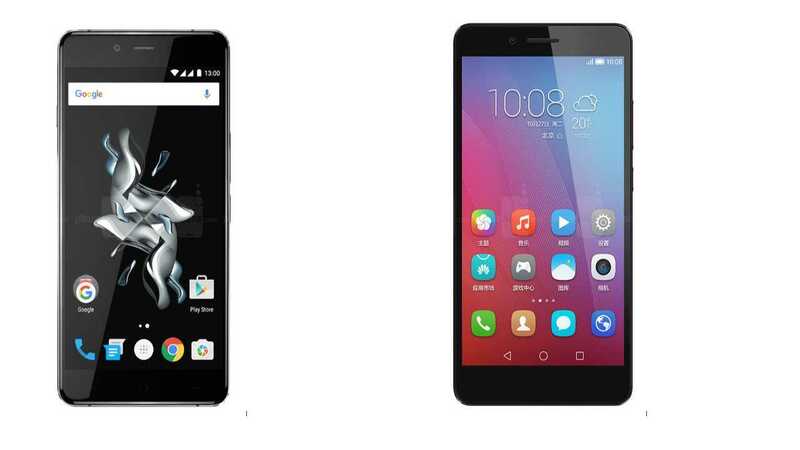 So, will it be the Huawei Honor 5X or OnePlus X?